Soon, if not already, a mobile device will be your customers’ primary digital media channel, creating both unprecedented opportunity and challenges. The intensely personal nature of smartphones, allowing users to completely customize their experiences, is one of the most exciting and enticing aspects of the mobile revolution. Marketers have the opportunity to build convenience and value into a powerful omni-channel customer experience and tailor targeting and engagement strategies to specific customers or customer segments. This has led many to adopt a “mobile first” approach to customer experience design, yet interestingly, marketers and the media have a tendency to talk about “the mobile consumer” as if there were just one type and that all consumers use their mobile devices in a similar way. But that couldn’t be farther from the truth. The Always-On Consumer report details seven distinct types of today’s smartphone users ranging from those who rarely put their device down to those who barely pick it up. The report examines the attitudes and behaviors of smartphone owners and how the rapid adoption of these devices has transformed the way customers learn about and buy products. Prodigies: Making up 5 percent of smartphone owners, Prodigies are constantly connected and are the first to adopt new technology. They are a strong market for Windows phones and open source platforms that allow for greater customization. 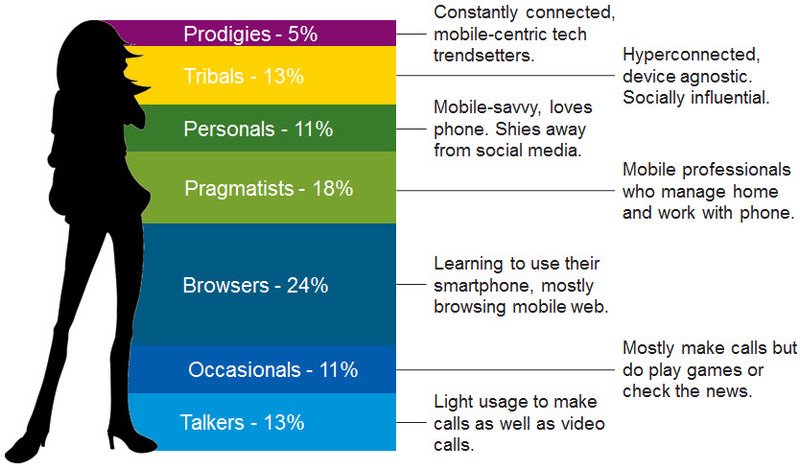 Chrome, Google+ and Google Talk have high concentrations of Prodigies among their users. Prodigies are nearly 10 times more likely than the average smartphone owner to say they would be interested in receiving ads on their phones, and seven times more likely to say they would buy the products in those ads. Likewise, they are nearly six times more likely to purchase products they see advertised on social media. Tribals: This group is hyperconnected, often through multiple devices. Thirteen percent of smartphone owners are Tribals; they are both heavily influenced by and strong influencers of others through social media. Tribals are the most likely to use the Internet to plan shopping trips and are influenced by Pinterest, Instagram, Flickr and other highly visual properties. Personals: Personals are mobile-savvy users who love their phone but are increasingly cutting out the middle man when it comes to connecting with friends, preferring direct messaging to social media. In addition to heavy messaging app usage and low social media usage, Personals are 2.3 times more likely than the average smartphone owner to say they would be interested in receiving ads on their phone and 60 percent more likely to say they would actually purchase products advertised on their phone. Pragmatists: Pragmatists are mobile professionals who make up about 18 percent of the smartphone population and use their phones primarily to balance their work and personal lives. Pragmatists are open to advertising on their phones, but they need to get something in return. Otherwise, this segment is less likely than average to purchase items they see advertised on their phone. Occasionals: Eleven percent of smartphone users are Occasionals, those that use their smartphones mostly for making calls, playing games and checking the weather, while the myriad of additional features go unused. Occasionals are much more receptive to digital campaigns on their personal computer and more open to native advertising in print newspapers and e-readers. Talkers: Mobile use among this group is fairly light. At 13 percent of smartphone owners, Talkers use their phone mainly for verbal conversations and the occasional video call. As such, digital and mobile campaigns are most effective with this group primarily to supplement campaigns run in traditional media. Learn how to customize your mobile campaigns for maximum engagement by these key segments, download the Always-On Consumer report.